We are witnessing a changing world in both quality and quantity, in which Asia and the Pacific are emerging as the most dynamic economic region, driven by economic integration and scientific and technological development. The largest economies in the world have introduced ASEAN-centered policies such as China's Silk Road and the United States’ Indo-Pacific Partnership Strategy. In these programs, ASEAN and Vietnam are seen to play a very important role by partners, as it is at the heart of large consumer markets, especially ASEAN, India and China. 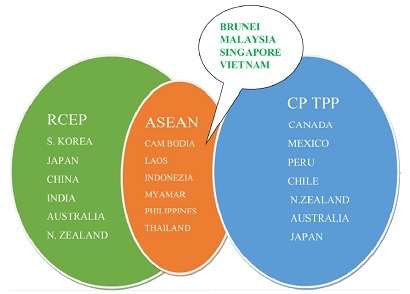 This is illustrated in the largest regional and international integration programs in the world like Comprehensive and Progressive Agreement for Trans-Pacific Partnership (CPTPP) and Regional Comprehensive Economic Partnership (RCEP) (see Figure 1). This role will be promoted in the context of the strong Industrial Revolution 4.0. The current technological revolution is completely different in stature, scale and complexity compared to any previous technical revolution. Featured by new technologies that blend inorganic and organic worlds, digital world and biological world, this revolution’s development steps are affecting every rule, every economy, every profession, every organization, and even challenging the concept of “human.” Organizations and businesses must adapt to the fact that administrative institutions and traditional organizational structures are concentrated, top-down hierarchies will be shifted to new organizational models, from hard institutions to soft or flat networks. New technologies, working groups and interactions they create allow almost anyone to make added values for their organization. The rapid pace of change of this revolution is posing challenges at every unprecedented level to managers. The rigid, planned organizational model often runs after events, not responding to the pace of technological change and its impact scale. Robust information technology development forces leaders to make business decisions very quickly in order to reduce risks and seize opportunities. In order to make quick decisions, there is a need for software that supports human brains in an unprecedented way. That will greatly affect organizations and businesses, trade, investment and young-generation development. In such a context, comparative advantages of natural and technological resources as well as new management methods to create more value-added products will be based to enhance corporate competitiveness. 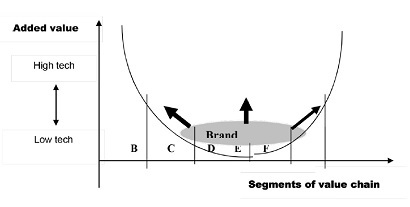 Especially, we will focus on high value-added segments in the product value chain (see Figure 2) such as: Product research and development (A), product design (B), marketing (E - brand, price, sales, etc. ), and after-sales service (F). Segments such as manufacturing (C) and processing (D) have lower added value. It is clear that brand name strongly dominates all value segments of a product. However, that dominance is stronger in A, B, E and F segments. Therefore, while the product value chain has extended and expanded globally in the integration process, multinational corporations tend to outsource C and D segments in developing countries. And, this is also an opportunity for developing countries to attract investment and develop partners in order to upgrade their production and business level in short and medium-term strategies. This also explains why the world today is both competitive and cooperative. Nevertheless, in the long-term strategy, developing countries and businesses also need to develop and expand their engagement in A, B, E and F segments to improve their performance. Moreover, it is necessary to make breakthrough in E segment - marketing - (pricing, selling, etc.) by developing product and service brands. All changes lead to a smart economy. Smart city, smart business and smart economy are increasingly becoming national strategies aimed to take advantage of the world’s positive changes to make headway and secure two strategic purposes: (1) Highly competitive products, and (2) better worker life. A smart business must be effective and sustainable. A high-tech business applies high technology. In the current technological age, a smart business will surely use high-tech to impact its product value chain segments (Figure 2) to create more added value. That also explains why a cup of coffee sold in the European and American markets costs US$2, of which the value of coffee is only about 1-2 cents. An example of using high-tech for standardizing for global positioning to manage time and product quality in the course from production to end users (see Figure 3) was recommended at the Asia Pacific Business Summit 2017. Today's technology is also marketing products and services through the use of e-commerce. Looking at the second largest economy in the world, Chinese enterprises are growing fast, led by high technology and e-commerce which are widely applied in the manufacturing and business sector. In order to become a smart business in the era of internet of things (IoT), many works need to be invested and developed. 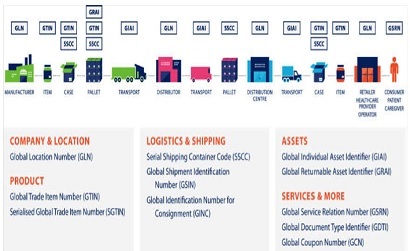 The development of internet and IoT technology will help businesses create added values for products of a company in segment E (Figure 2) through e-commerce. Businesses use sales networks through various forms of sales promotion by creating and advertising websites, designing orders, giving offers, exchanging information, and connecting with customers’ electronic systems. However, in most cases, maintaining and operating online products is too costly and time-consuming. In this case, it is possible to use shops, intermediary electronics stores and sales commissions. Steps of using an electronic store: Signing and designing the name of the farm, in-stock information, electronic store intervening to get more access, consumers placing orders and filling in credit card information. In case the order is accepted by the business, the store collects money from the credit card and notifies the consumer of this. Consumers receive goods. When consumers receive the goods, the store settles payments for the business. B2B is a form of business adopted by different companies and organizations. B2B can perform transactions without having traditional intermediaries. However, B2B often uses e-broker created by a third party called an electronic trading platform to quickly respond to product price changes. Selling price can change by the second. When the price changes, the business place a buying price. The bidding system starts and operates. The buyer and the seller can see the bidding process. The deal is completed when the buying price and the selling price is matched. The price is determined by the trading platform in two methods: Bidding and quoting. The buyer and the seller register via the website to take part in the trading platform. Online sales can save time and cost. In particular, consumers can access information about production process and keep track of businesses complying with technical and labor standards. Besides, businesses can connect and communicate directly with customers, thereby capturing the market in the fastest way. This is significant because, according to the recent survey, only about 30% of Vietnam's export value is entitled to preferential tariffs. In other respects, the utilization rate is also very low. One of reasons for this reality is businesses lack market information about demand, supply and demand development, trade flows and market investment. Without this basic information, the process of planning business plans, identifying target markets and products and estimating profits is considerably limited. In a changing world and region, there are also great opportunities for Vietnamese businesses. By building the smart business development strategy and reasonably applying high technology, online sale technology and e-commerce will create added values for product value chains that will help develop a national smart business community and carry out the Government's strategy in the era of economic integration and Industry 4.0.